Fast forward almost 3 years later. Instagram isn’t what it used to be. Instead of showcasing images taken by phones, it seems now that it’s turned into users posting screen shots, taking photos of their DSLR LCD screens, and even using photos that weren’t taken with a phone. Maybe it’s just me, but that goes against everything I enjoyed about Instagram. To me, Instagram was about finding amazing photos taken by a camera phone, realizing that you can take great photos without a full size DSLR. While I used to enjoy all the filters Instagram had to offer, it seems filtering photos is now the latest craze in the photography world. If your photo doesn’t look washed out, if it isn’t extremely over-processed, if it doesn’t look like it was taken in the 70s, if your photo doesn’t have a person’s eyes glowing like they just ate a stick of plutonium, then it’s not popular. I admit, I’ve fallen for the “I-need-to-over-process-this-image-so-it-looks-amazing” fad, but I’ve gotten tired of it. Sure, no photo is perfect straight out of the camera and it will need some touch up work. But what are we trying to achieve when taking photos? Are we trying to create something that’s fake? If you finish processing a photo, and you have a halo around your subject, you’ve probably gone too far in my opinion. Now that I’ve totally gotten off the subject, I hope you can see where I’m coming from and why I quit Instagram. It’s not a big deal, and I’m sure my presence will not be missed, but I just wanted to throw this out there. I’ll leave you with this: 2013 Sony World Photography Awards. Not a lot of over-processing going on there. 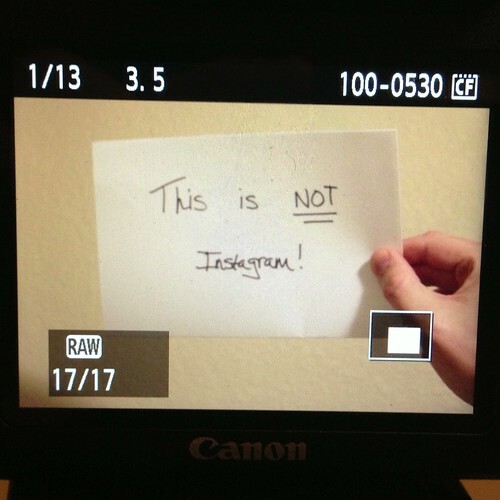 Note: I’m not trying to bash photographers that use Instagram or over-process photos. This is just one man’s opinion.